Certificate in accordance with European Standards EN 1176 by ​​the German TÜV - SÜD. Made of pine autoclave treated with non-toxic salts. Parts list: N°1 ladder with rungs iroko Ø 45 mm set at two pillars inclined section 9x9 cm with 2 others opposed uprights that are joined at the top by two panels of mahogany plywood okoumé grooved phenolic-glued and treated with impregnation with rounded edges and finished with colorful non-toxic wax-based paints can be diluted with water, another element of the conjunction is a platform in phenolic glued birch plywood finished with colored films on both sides. Complete with a safety handle steel pipe, shaped and painted in the oven to 180°C. 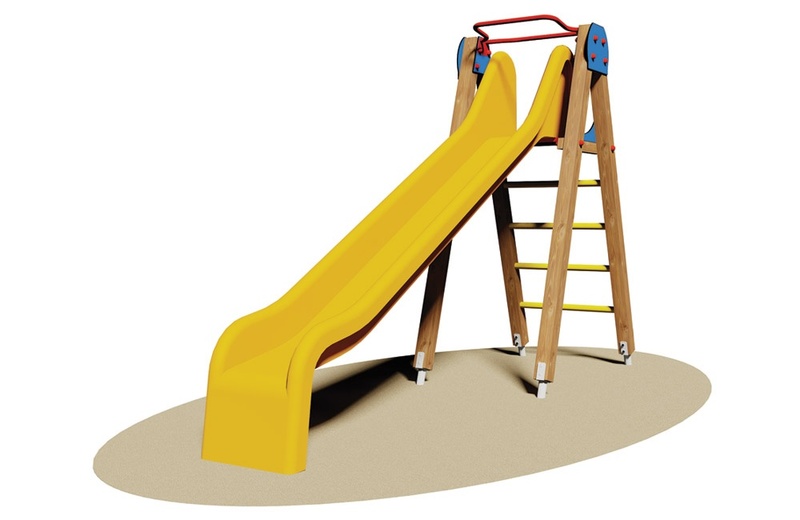 N°1 slide fiberglass h. 150 cm made ​​with multiple layers of high density resin. Assembled by 8.8 galvanized steel bolts and nuts. Elements covernut under colored nylon. Attacks galvanized metal for anchoring to the ground.